Actually a world premiere in extrusion: for the first time outside their home region, JSW are presenting their latest development – the TEX 44 Alpha III co-rotating twin screw extruder – for highly economic compounding, masterbatch production, devolatilizing, under water pelletizing, rubber / elastomer de-watering etc. The new extruder manages the entire range of standard polymers as well as the latest engineering and super engineering plastics. A perfect compounding plant with a comprehensively controlled extruder is the basic prerequisite for economic and trouble-free processing of perfect granulates in plastics processing units. And this is what we can prove to plastics experts who are invited to come to our stand 41 in hall 13 to see our new compounding extruder during K 2013 “says Tadashi Gion, JSW’s Liaison Officer. Higher torque is the key factor: the design of the new extruder encompasses the main operating structure of the predecessor series TEX Alpha II so that those users of JSW compounding extruders just need to take another step into far more productivity. With the new TEX 44 Alpha III, the processor gets a much higher throughput in a compact machine which safeguards consistent top polymer quality and lower polymer temperature during the process at a reduced screw speed. Performance tests have shown that the productivity could be raised and process temperature reduced. All these results have one extra advantage, i.e. correspondingly lower current consumption and thus considerable energy savings. The 36% higher torque than the previous model, results from a new gear box, gears and bearings design to increase the performance and operating reliability of TEX Alpha III screw barrel. The wider processing window at higher torque also results in aggressive or rather powerful kneading and mixing. More safety in operation: a mechanical torque limiter (no lead/lag time) cuts the connection to the screw instantaneously when an extremely unlikely event of malfunction or critical process situation is detected, thus protecting the equipment from expensive damage and downtime. The new drive sys-tem includes a powerful infinitely variable three-phase motor. It can use a water cooling system which is quieter than air cooling. In all aspects of the drive system, JSW engineers have placed great em-phasis on designing equipment and components with the least possible energy consumption thus pro-tecting the environment sustainably. 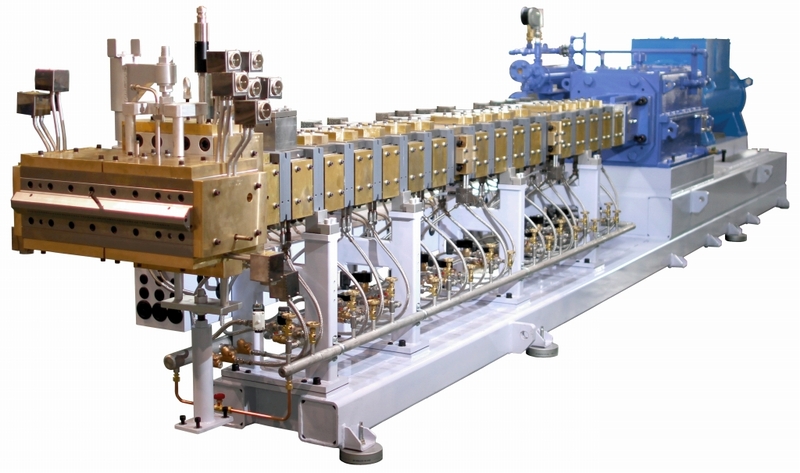 JSW’s twin screw extruder generally uses the latest 64-bit RISC high speed control system – EXANET by JSW – featuring a 15 inch colour LCD touchscreen for optimum process control and surveillance. This control system accommodates all “easy-settings” and process parameters and can integrate auxiliary equipment from the feeding and mixing system downstream to the pelletizing plant’s strand cutter. The comfortable and user-friendly EXANET stores thousands of compounding, master-batching, devolatilizing, under water pelletizing, elastomer dewatering etc. recipes for easy repetition and 100% repeatability of the specific process after months or years.After K 2013, extrusion experts can see and test the new TEX 44 Alpha III extruder in JSW’s Technical Center in Overpelt/Belgium. 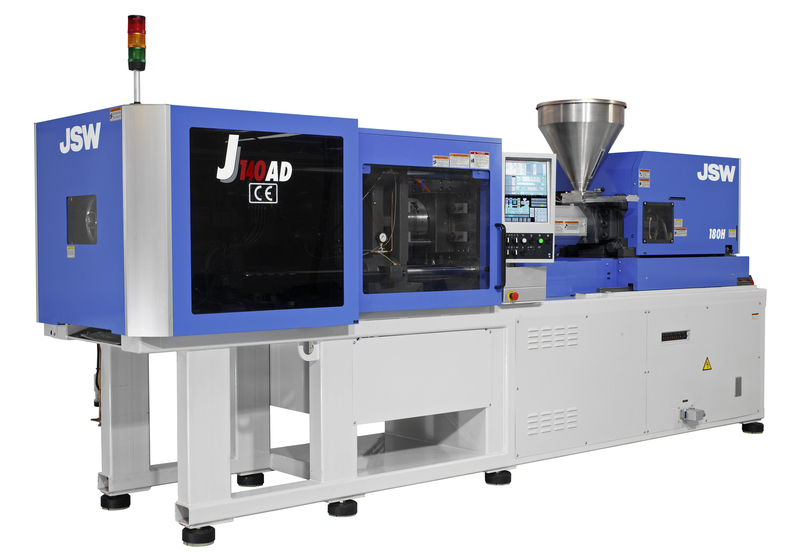 Injection Moulding: During K 2013, JSW and their European sales and service partners, WINDSOR Kunststofftechnologie GmbH, Hanau/Germany, present in Halle 13, Stand 41, two machines of the J-AD series – 1400 and 3500kN clamping force – with production-relevant highlights. The J140AD moulds a technical hollow part in PP (injection weight = 80 grams, cycle time = 60 seconds). Thus, two geometrically differing parts are moulded simultaneously in varying cavities of the high-tech mould. The parts are then assembled in the mould proper and finally circum-moulded with PP. These are three operations in one! The J350AD produces a transparent hemispherical container in PP – 400 g injection weight – in no more than 17 seconds. This feature represents a cycle time saving of 30% relative to comparable machines. The total productivity and performance advantage is easily calculated from this value. Precise and synchronous movements of all relevant axes plus high-reproducibility parallel functions are a guarantee for outstanding mould venting. The machines are gentle on moulds, shorten cycle times and provide optimum quality parts. Up to six mould breathing and compression functions can be integrated into a single clamping operation. Clamping pressure build-up and injection may run exactly synchronized. A clamping pressure build-up profile may be defined for every point along the path of the injection process. The full control procedures that have so far been available for the J-AD line only are now also avail-able for larger units. Outstanding control equipment, supplied by JSW now also allows registering relevant process parameters every 62 microseconds. These can be evaluated and optimized if nec-essary. Superior performance by machinery comes with attractive output data, low machine prices and little power connecting load. The energy-optimized 1400 kN exhibit, for instance, just needs 14,7 kVA of power supply. Brief Company Profile: The renowned Japanese machine builder Japan Steel Works, Ltd. (JSW) looks back on over 60 years of experience in making plastics processing machines. The first single screw extruder was introduced to the market in the early 1950es and the first twin screw extruder was presented in 1979. The world’s largest extruder, TEX 400 Alpha, was commissioned in 2004. JSW also has extensive experience of more than 25 years in building full electric driven injection moulding machines. Innovation plus progress have always been the lode stars of this company. They came very early in developing all-electric injection moulding machinery for the small and medium clamping force range and up to more than 13,000 kN, which they established on the market. Meanwhile the output share of all electric machinery has come to dominate their production and it now stands at 95 per cent of the entire IMM volume produced by JSW.